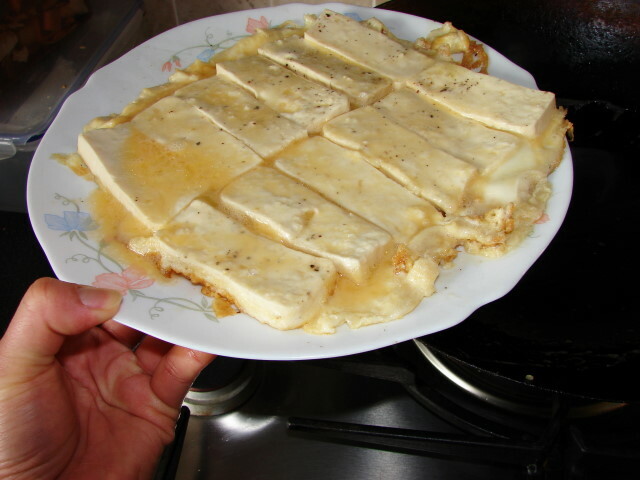 Guo ta dou fu 鍋塌豆腐 is from Shandong. It's fried tofu pieces coated with beaten egg then cooked in a sauce. If you like tofu this is a lovely light dish. Take 2 - 3 pcs of firm tofu, cut into 1cm thick. 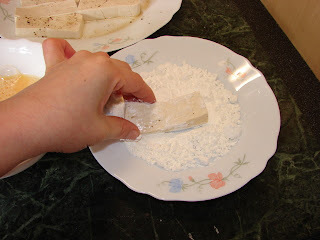 Marinate with pinch of salt , a dash of cooking wine and pinch of pepper. Chop some spring onion, one small clove garlic, a small piece of ginger and a little red chilli for colour and heat. Set aside. Put some potato starch or cornflour (cornstarch) onto a plate. Prepare a sauce with 1/2 cup water, 1/2 tsp chicken bullion, dash of cooking wine, dash of light soy and 1/2 tsp cornflour (cornstarch). 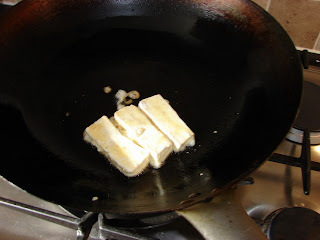 To cook this first heat wok with few tbsp oil till medium hot. 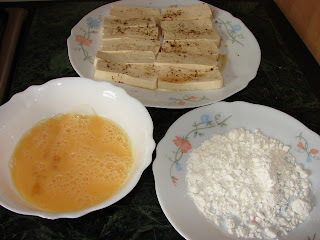 Coat tofu lightly with starch. 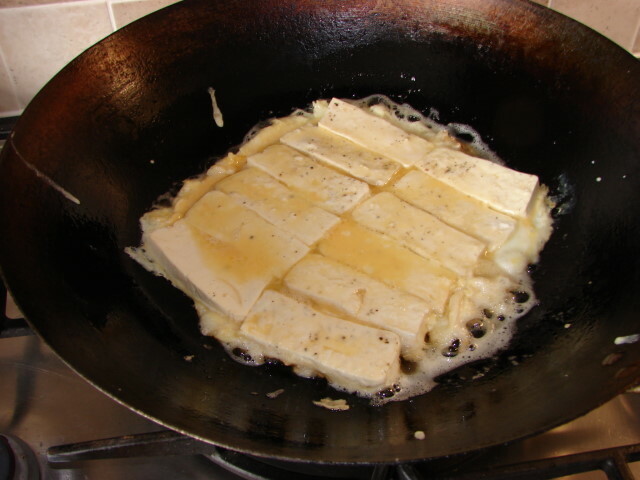 Tofu pieces forming one large piece. 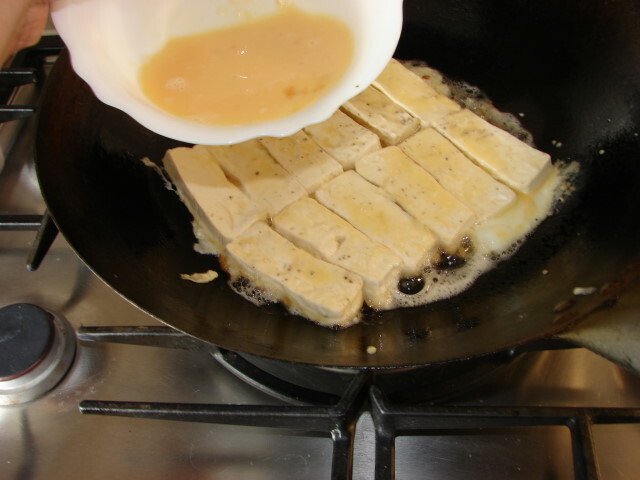 Pour in some of the leftover egg between tofu pieces. Fry till bottom is golden and fragrant. 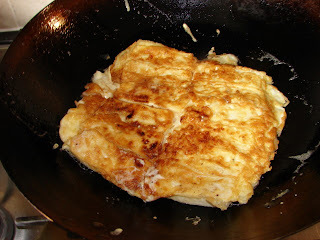 Now ready to fry the other side. If you dare you can flip the whole piece inside the wok. 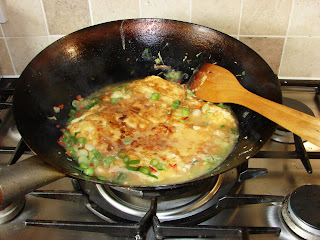 Easier way is to slip the whole piece onto a plate then tip it upside down back onto the wok. Pour in remaining egg around and under. Fry till bottom side is golden. Sprinkle the spring onion, garlic, ginger and chilli around the side of the wok while the bottom is frying. 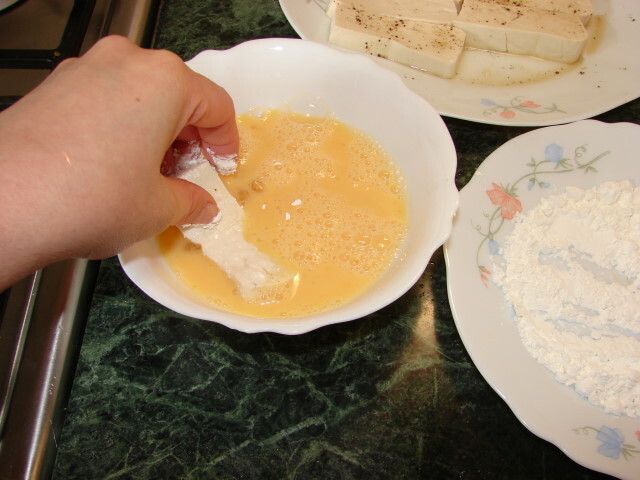 Then pour in the sauce around the side. Cook till the sauce is very hot and thicken. Ready. Hi Sunflower.I'm so glad that your blog has reappeared - as a long time follower I was stricken with panic since I cook at lot from your site - whenever i'm lacking inspiration I come here (I should comment more but i'm errrrr shy).Anyway,I made this tonight and all agreed that it's easily one of the best tofu dishes we have eaten.Destined to become a regular.Thanks as always! 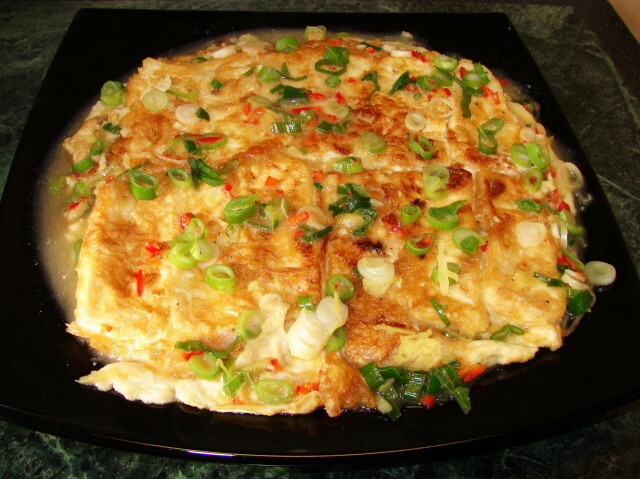 This is one of my most favorite recipes! I have been making it for years. I thought I had lost it forever because it was in my email and I had just gone through my emails and deleted everything, along with this recipe - on accident! I was very upset. I am so glad that I found it again! Thank you for posting this delicious recipe. My whole family loves it! 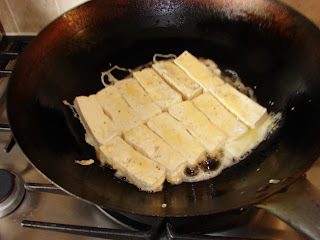 I should try your other tofu recipes on this site, because they are probably all very good as well. Thanks for sharing!